The Canada Occupational Safety and Health Regulations apply to Federally Chartered companies, companies with locations in more than one province, and organizations which do not fall under Provincial guidelines. 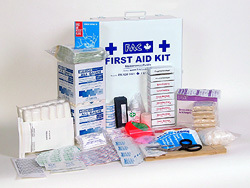 The MINIMUM First Aid requirements for employers are spelled out in the Canada Labour Code regulations. In no sense could this be considered a recommended standard. FAC First Aid does not supply kits to this minimum standard. All of our kits exceed the regulations by a large margin, and yet our prices are in line with basic kits. The kits we supply contain First Aid products that we ourselves would put in our own facilities  why should our customers settle for less? The law also says that the employer shall also make sure that the First Aid Station is always in the charge of a worker who is the holder of a valid First Aid Certificate and who works in the immediate vicinity of the station. The kit has to be inspected on a monthly basis to ensure that it still meets the standard. The Canadian Occupational Health and Safety Act says that in addition to the kit, you must have a stretcher and blankets on site. The CLC-CD kit is designed for the larger office or facility. It contains a wide variety of supplies, intended to handle most situations. We also recommend this kit for use in public facilities, such as a church or meeting hall, where substantial numbers of people are likely to be present.